Hi! Thanks for visiting my website. If you would like to receive occasional email updates or mailings about my work, please fill out the relevant fields in the form below. For more frequent updates, join me on Facebook and Twitter. Rest assured I will NEVER sell or trade your email address or contact information to anyone, EVER. I don't like spam and junk mail either and I respect your privacy as much as I value mine. 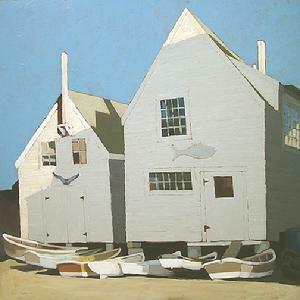 "Fish Beach, Monhegan Island, Maine", 36" x 36"